The following is a guest post by John Beyer, author of Soft Target. The idea for the novel Soft Target came to me as I sat listening to terrorist experts during a conference in 2012. Colonel David Grossman was the main speaker and discussed the idea of Wolves attacking Sheep and the only ones to protect the Sheep were the Sheep Dogs. He asked the crowd of nearly 1,000 attendees who amongst us were those Sheep Dogs. I was sitting next to police officers, public school administrators, military personnel, and many others whose main duty was to protect those who could not always protect themselves. My job at the time dealt with a medium sized public school district and was as the Director of Student Welfare. The welfare of the students and staff within that district was my responsibility. I took to heart what Grossman said and dwelt on it – were we all doing enough for the Sheep? He spoke of the Beslan massacre in 2004 in North Caucus which resulted in the deaths of nearly 400 children and adults. The elementary school which was taken over on the first day of school by Islamic terrorists left nothing but carnage and misery behind. With the number of Islamic terror groups increasing each year, I wondered if the schools in the United States were prepared. I knew they weren’t since who could be prepared for a bunch of fanatics to storm a school with the intention of murdering masses of innocent children and school staff? Thus Soft Target was born – the writing was painful but went quickly as I looked back on my days in law enforcement when I was a member of SWAT. We were never trained on how to handle a school takeover but in a lot of missions we dealt with irrational and illogical people determined to do others harm. It would seem to be the same as with a terrorist group – those individuals with a perverted sense of ideology. The only common denominator with these same fanatics was the thrill to kill. 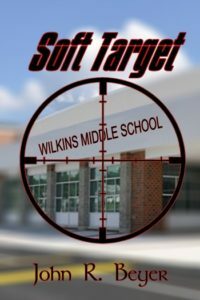 I placed the setting for Soft Target in a small nondescript city in Southern California and the target was Wilkins Middle School. The main character was Yuri Shakirov – an ex member of the Soviet Special Operations Unit – Special Ops in our nomenclature. He was there in Beslan and had firsthand experience dealing with Islamic terrorists. He was also there in Southern California when Wilkins Middle School was taken over and was the main player – asked to assist by FBI agent Thomas Ware since this was the first time such an occurrence had reared its ugly head in the United States. This is as far as I will delve into the contents of my novel, and I hope my prediction and gut feelings are wrong: America is not ready for such an event as what happened in Beslan on that September day in 2004. And I hope we never have to be – Soft Target is a fictional piece of work – reality doesn’t always follow the same path. More about the author and his work: John Beyer’s website. 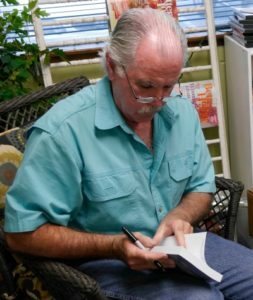 Former street cop, training officer and member of SWAT, John Beyer has been writing most of his life. He’s traveled to at least 23 countries (and was actually shot in the head in Spain in 2000 during a march between Neo Nazis and Communists two days after running with the bulls in Pamplona). He was caught in a hurricane off the coast of east Baja (Bahia de los Angeles) while kayaking and lived to tell about it. Essentially, it’s hard to tell where experience leaves off and fiction takes over. You’ll want to read his books.